The New York Knicks send the Dallas Mavericks reeling into a 6 game losing streak, as the Knicks rookies lead the team to their first road victory over the Dallas, 118-106. All the nonsense aside, give me the French Prince over Smith Jr. every day of the week and twice on Sunday. Frank seemed to get the better of the matchup in this game, not only on the stat sheet and in the win column, but Frank might own some real-estate in Smith Jr.’s head as Dennis showed some frustration with Frank late in the 4th quarter with a hard foul and his rendition of “Iverson-Ty Lue Step-over.” The final boxscore between the starting point guards was Smith Jr. with 23 points, 6 turnovers, and a donut in the assists, steals, and blocks column. Meanwhile, the French Prince had 7 points, 7 assists, 3 steals, 3 turnovers, and 1 block, while losing minutes to an explosive Allonzo Trier. Speaking of the undrafted guard, Iso-Zo had a career high 23 points on 8/10 shooting in just 23 minutes, with 14 points coming in the 4th quarter on 4/4 from the field and 6/6 from the free throw line. This game was all about the rookies as Mitchell Robinson racked up his first career double-double with 13 points and 10 rebounds against DeAndre Jordan, a top center in the league. Pretty impressive for a guy who didn’t play basketball last year. Just nine games into the 2nd round pick’s young career, Coach Fiz seems to be on board with Robinson, who has a propensity for intense defense, as the starting center moving forward. Count me in Coach! Coach Fizdale again rolled out the same starting lineup of Frank, Dot, Hardaway, Vonleh, and Robinson which seems to be gelling together, slowly but surely. The most impressive aspects of this Knicks victory was the 65 points off the bench and a season-high 26 assists for the young squad. However, the final score and the 3rd quarter do not tell a full story of the game, as it was tight between the two teams with streaky runs throughout the game, besides those 12 minutes to start the 2nd half. The second half was unexpected to say the least, for even a casual follower of the New York Knicks for the past… I don’t know… 15 years? The Knickerbockers absolutely unraveled the Mavericks in the second half, starting with a 13-3 run, which they never looked back from. The Knicks won the 3rd quarter 33-18. That’s weird to look at, even after the fact. Vonleh got into some early foul trouble and Tim Hardaway Jr. put up 18 points in an inefficient night going 7/17 from the field and 4/11 from downtown. If it wasn’t for the blowout win, THJ would be under harsh scrutiny for his continued poor shot selection and less than impressive defense. Enes Kanter, who has been frustrated with his new role on the bench put up a pedestrian 13 points, Lance Thomas had 10, and D-Dot and Mario Hezonja each finished with 11 points. Not to be distracted by his unimpressive 11 points, Dotson was essential in the Knicks victory as he was always seemingly at the forefront as a scorer and defensive playmaker. Allonzo Trier, as the primary ball handler, played extended minutes in the 4th quarter with Vonleh and Thomas sitting out with foul trouble. Coach Fizdale told media after the game that he was so encouraged by Zo’s performance and confidence on the court, that Coach believes Trier has earned more minutes in crunch time. Is the Knicks organization actually taking a turn… for the better? The New York Knicks have finally received that memo and are living by it. Everyone, and I mean everyone, from casual NBA fans, to national pundits, to local reporters, have taken their [substantiated] shots at the Knicks front office in the past. But early in 2018, let credit be given where credit is due. In June of 2016, The New York Knicks made headlines for trading Robin Lopez, Jose Calderon, and Jerian Grant for Derrick Rose, Justin Holiday, and Chicago’s 2nd round draft election in the 2017 NBA Draft. This trade was all about the resurgence of Derrick Rose and his comeback in Madison Square Garden, the Mecca of basketball. The asset that flew under the radar at the time of the trade, but is now emerging is that 2nd round draft pick, is Houston phenom Damyean Dot Dotson. The Knicks front office, which included Phil Jackson and Steve Mills, made it clear they were in the market for buying draft assets and not selling them, as NBA general managers and fans alike were accustomed to New York selling off future draft picks for “win-now” players… and as we all know… the Knicks haven’t “won-now” in about two decades. Just to recap, the Knicks have selected the French Prince and Dot in the 2017 NBA Draft, Kevin Knox and Mitchell Robinson in the 2018 NBA Draft and signed the… yes i’m calling it now… STEAL of the draft, undrafted Allonzo “Iso-Zo” Trier from Arizona. 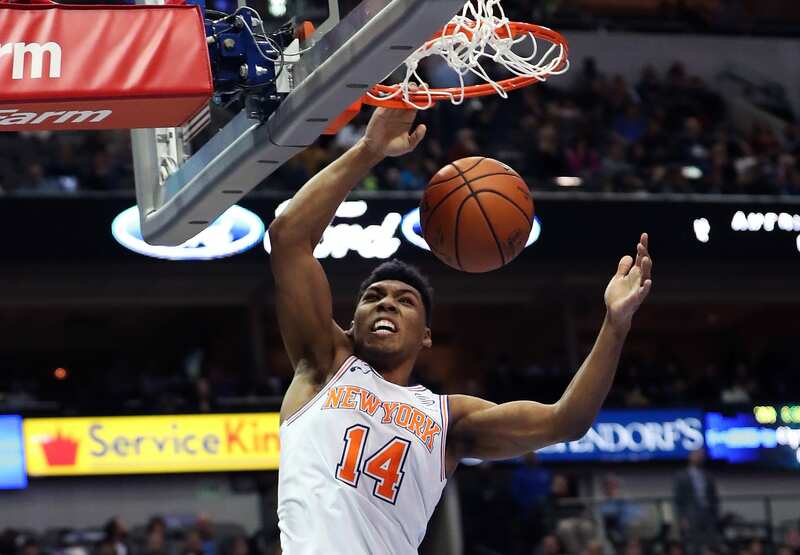 Robinson was destined to spend time in Westchester with the Knicks G-League affiliate and Allonzo Trier has already outplayed his current 45 day contract… has Christmas come early for the New York front office decision makers?! Credit where credit is due, the plan is in place and the flowers are preparing to blossom. It’s one thing to lose two close games on the road in San Antonio and in Los Angeles verse the Lebron’s, but extending a losing streak to six at home against the rebuilding 2-6 New York Knicks, is a tough pill to swallow for the Mavericks. As a western conference team that historically plays well on their home floor, especially in the Dirk Nowitzki era, this was a disappointing loss and Coach Rick Carlisle has a couple of days off to right the ship in Dallas. Nowitzki, the soon to be Hall-of-Famer, was notably absent for the Mavs was the 40 year-old has yet to see his first live action in his 21st season while rehabbing an ankle injury. It may not seem like a big deal to the average observer, but with 4 minutes to go in the 3rd quarter and the Mavs looking for a spark, Tim Hardaway Jr. took the ball down the court, four-on-one in transition, and took an unsurprising and ill-advised contested three-pointer with 18 seconds in the shot clock. There is absolutely nothing surprising about that. However, the head-scratcher emerged with DeAndre Jordan blatantly pushing Doncic out of the way for a rebound. Jordan is a seasoned veteran and he knows he needs outstanding numbers on this Dallas team slated for the lottery, to pursue another massive free agent contract. Seemed like Jordan knew what he was doing as he ended the night with 4 points and wait for it… 10 rebounds. Rookie phenom Luka Doncic did not look too pleased as the guard was visibly frustrated giving a slight shrug and head shake to the crowd, owner Mark Cuban seemed to mouth off some pleasantries as he was clearly irritated, and most importantly DeAndre did not seem to bat an eye. Not a good look for the 6′ 11″ center on a 1 year, $24 Million contract to rustle any feathers with not only the future of the Mavericks, but more importantly for Jordan, the facilitator of the offense. It is no secret that the newly acclaimed free agent likely does not have the benefit of the doubt with this organization, after he famously nixed Mark Cuban and the Mavericks for the Clippers just a couple of years ago. Luka Doncic is masterful at the point guard position and is honestly a sight to see for basketball lovers everywhere. The rookie ended the day with 18 points, 6 assists and of course… 9 rebounds. Just for a little bit of salt into the wound of the young guard, that would have been his first double-double of his young career and a great spin zone into positivity for the Dallas organization to build on, but to no avail. It wasn’t all bad for the Mavericks as Dorian Finney-Smith off the bench for Dallas was seemingly unstoppable for the Knicks second-unit. Smith carried the Mavs in the second quarter, temporarily cutting the Knicks deficit, and ending the game with 19th points, on 80% shooting, and 7 rebounds. Against the spread, the New York Knicks are now 5-3-1 overall and 2-1-1 on the road in 2018, while Dallas fell to 5-4 and 2-2 at home after the Knicks made the pro’s look like joe’s at the sports books yesterday, with Dallas closing at 6 point favorites. Although this game was close at times in the first half and the Knicks had some foul trouble, New York was the right side from the tip-off. Vegas was sharp on the over/under line as it opened at 213, moved to 217, and still went predictably over at 224. The Knicks are set to hit the road for one game showdown in Washington D.C., right on the heels of an important election day in the nation’s capital. (GO VOTE!!). New York will face a Wizards team coming off a brutal loss at home against the Thunder on Friday November 2nd. This will be a tough matchup for the young Knicks backcourt going up against perennial All-Stars John Wall and Bradley Beal as the Wizards look to get the 2018 season on track, despite their deceivingly putrid 1-7 record. The Wizards have lost to the Heat, Raptors, Warriors, Clippers, Grizzlies, Thunder, and although they have not looked particularly sharp, Washington has nothing to be ashamed about… besides the loss to the Kings. The Knicks, on the other hand, have only defeated the Hawks, Nets, and now Mavs up to this point, racking up losses against the Celtics, Nets, Bucks, Warriors, Pacers, and Heat. With New York coming off a dominant win in Dallas and the Wizards coming off a beatdown by the OKC Thunder on their home floor, the writing is on the wall for the youngest team in the NBA to play like it. Running into a desperate Wizards team on the road will be huge test for the Knicks in this early season. Kevin Knox will play Monday at Washington Wizards.